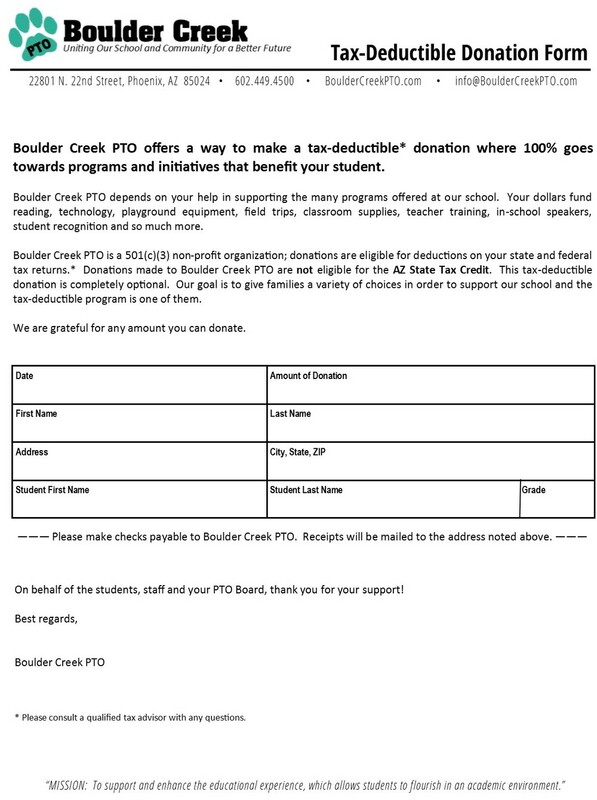 Boulder Creek PTO offers a way to make a tax-deductible* donation where 100% goes towards programs and initiatives that benefit your student. Boulder Creek PTO depends on your help in supporting the many programs offered at our school. Your dollars fund reading, technology, playground equipment, field trips, classroom supplies, teacher training, in-school speakers, student recognition and so much more. Boulder Creek PTO is a 501(c)(3) non-profit organization; donations are eligible for deductions on your state and federal tax returns. * Donations made to Boulder Creek PTO are not eligible for the AZ State Tax Credit. This tax-deductible donation is completely optional. Our goal is to give families a variety of choices in order to support our school and the tax-deductible program is one of them. We are grateful for any amount you can donate. On behalf of the students, staff and your PTO Board, thank you for your support! *Please consult a qualified tax adviser with any questions.